Companion scanning is blowing up! There are more than a few scanners out on the market, and now there’s a new one from Motorola. It’s the Symbol CS4070, I guess they’re going back to their roots now that Zebra is buying them. And it kind of makes sense; at this point there are 3 different Motorola companies: one potentially owned by Zebra, one owned by Google/Lenovo, and one out on its own. And the Symbol LS2208 never got Motorolasized, so there’s a precedent. Anyway, the Symbol CS4070 is their 2D companion scanner, designed for mobile POS, bed-side scanning in health care environments, and more. It’s available in a standard black model, as well as a white model made with health care plastics, so there’s one for before or after Labor Day. These scanners use the same scan engine that is in their DS4800, so you have a pretty tremendous scan range, pretty comparable to a linear imager. They run in Bluetooth mode for pairing to iPhones, Android devices, or other Bluetooth devices, or you can set it up as a batch device to connect to your PC and download spreadsheets of scanned data. It’s very much like the CS3070 but on steroids. We were able to test out a beta unit for a few weeks, and it’s really a great scanner. I’ve been told that the performance will improve with the production models, which just seems like a bonus. The unit I received came with its Product Reference Guide, affectionately referred to as the PRG by our Motorolalien friends. PRGs are massive tomes, 330+ pages of everything from how to set up your scanner to the arcane practices required to pair it to a Pontiac Aztec. Maybe not so much on the latter, but it’s a very in depth book. The CS4070, like the CS3000 line, comes with a config.ini file on its built-in memory. This allows you to make changes to the configuration if you don’t have access to the PRG or 123scan. I like having this secondary method for programming the scanner, as it allows you to do bulk configurations simply by uploading a file to each device. For registry applications, inventory checkout, or other bulk scanning tasks, the CS4070 is a dynamo. The scanner has 512 MB of memory built-in, meaning you can store… millions and millions of 13-digit UPC barcodes before it fills up. When you plug it into a computer via USB, it mounts as a flash drive, so you could theoretically upload an autorun procedure and a standalone application, ideally to export the saved data to whatever platform you happen to use. You could probably put Snood on there too if you were so inclined. This is the main course for the scanner, there’s a BlueTooth button on it even. Bluetooth mode allows you to pair the CS4070 to any Bluetooth-equipped device, or the optional Bluetooth dongle that Motorola sells. Setup takes a couple steps, either scanning the “Bluetooth HID mode” barcode in the PRG, or holding the Bluetooth button on the scanner until it beeps. Then all you have to do is scan for Bluetooth devices on your smartphone or laptop, and click pair. You might have to scan a PIN, those codes are in the PRG as well. If you have an iPhone, it just works. I think it’s because of the MFi chip that’s built-in. Once you’re paired to a mobile device, if you hit the minus key on the CS4070, it’ll toggle potential on screen keyboards, such as those on iOS and Android devices. This is great if you’re using the scanner for mobile inventory management and need to enter in descriptive or quantity data. 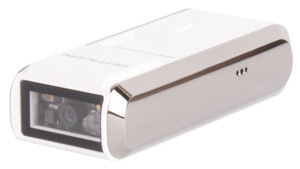 The CS4070 can charge either using a microUSB cable or one of the various charging cradles Motorola’s made. It only takes a few hours, and there’s a nice battery gauge on the front of the unit to let you know just how charged it is. The battery is removable, as well, so you can pocket a spare for longer scanning sessions. There are a few charging accessories available for the CS4070, in case you want something a bit more formal than a microUSB cable. A single slot cradle is available, which also includes a smaller secondary battery charging bay. For larger deployments, there are some larger options: an 8-bay scanner charger as well as an 8-bay battery charger. These also have all mount options, so you can have it in an employee area where it’s easy for employees to grab one and head off to do their duties. A Lanyard should be out soon as well, making it easy to clip the CS4070 to yourself in case you need to move or pick something up with both hands. 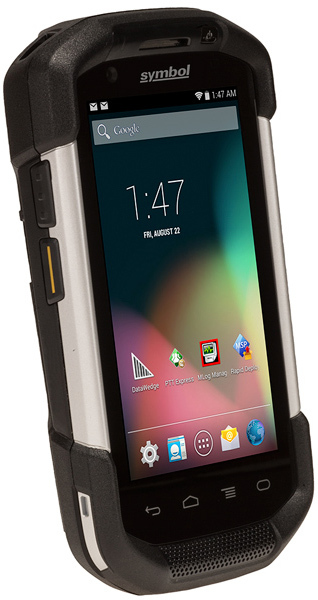 All in all, the Symbol CS4070 is a great companion scanning option for both batch or mobile scanning. The memory on the scanner is great in case you want to store files or apps, and the Bluetooth mode is relatively straightforward to set up. It feels pretty comfortable in hand, there’s a nice groove under the bottom for better ergonomics. Did you know that you don’t need a Square Stand to connect a USB barcode scanner to your iPad? We put together a walk through on Instructables with steps on how to use a cabled barcode scanner with an iPad or iPhone or iPod Touch or other iOS product. There are some hubs available that’ll let you connect keyboard and other HID peripherals to your iOS device, we got ours at Amazon. Anyway, head on over to that article and learn more! RedBeam has released an Android version of their Asset Tracking software, giving us a more complete data management solution for Android devices. And so we’ve put together a Motorola ET1 kit including the software and peripherals you need to track assets at your business. Asset tracking is pretty important at larger offices and multi-location businesses. Even at our office, we have lost a lot of time wondering where demo products have wandered off to or whether we even had the product in the first place. With RedBeam Asset Tracking, we can not only keep track of where products are, we can store additional data, including warranty and specifications. Let me give you an example of where RedBeam Asset Tracking would’ve saved me a ton of time. When I was at WWU, I managed 5 residence hall computer labs, plus a smattering of single station PCs in common areas. All told, it was about 65 computers and 8 printers. It wasn’t a ton of hardware, but still more than I could track by memory, so I had three or four spreadsheets of specs, serial numbers, and maintenance history. RedBeam Asset Tracker could’ve stored all that info AND been at my fingertips in a mobile computer or tablet. This would have been especially useful for the single stations, since they were often forgotten. Any time I had to send a PC in for repair, RedBeam Asset Tracking could timestamp when equipment moved locations, so other employees could determine if the PC was stolen without a lot of work. We even had a few PCs get stolen, and it was a bit of a search to get the serial numbers to campus police, whereas with Asset Track it could’ve been brought up quickly and easily. The bundle we offer includes the Motorola ET1 as well. I’ve talked about the ET1 a couple times already. Motorola’s enterprise tablet offers the functionality and familiarity of Android OS but with the durability and warranty coverage needed for business success. With the new addition of their Blockbuster 2D Imager as an add-on scanning module, the ET1 becomes a fantastic data collection and management tool. I really think this is a great combination, it’ll fit in really well at schools or offices, places where automated asset management will save you time and money, but you don’t necessarily need a huge industrial mobile computer to get the job done. I had to go with that pun. 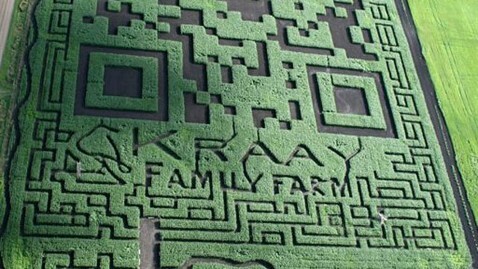 I mean seriously, that is one gigantic maize maze, and to turn it into a QR code is terrific. A family in Lacombe, Alberta, Canada owns a farm they turn into a corn maze every year, and this year they decided to turn it into the world’s largest QR Code. I’m not sure how many people will be able to scan it, but they say the code takes people to their website, giving potential visitors a rundown on all the fun activities there. This is a pretty unique way to get your name out, one because it’ll be in the Guinness book of records, and also because you can now use the picture of the maze, QR code and all, in promotional material and save a tremendous amount of space in your marketing collateral. Imagine a sidebar ad in an travel mag, 80% of the ad can be the QR code and the link takes you to more information, including schedules and booking. Potential visitors don’t have to enter in your website info nor call for more information, just scan the link and they get straight to your site. It’s great to see businesses using QR codes for more unique purposes but still getting the point across. I know more than a few people who have pushed back against QR codes, bringing up wtfqrcodes as examples why it’s not the best technology, so useful counterexamples are fantastic.